Conversely to the Extend Focus operation, it is possible to remove elements from the focus. In other words, it is possible to convert an element that is an active part of the dependency calculation into an element that is only an endpoint of a dependency from/to others element in focus. If there are no dependencies at all involving the elements removed from focus, they will disappear from the Exploration view. 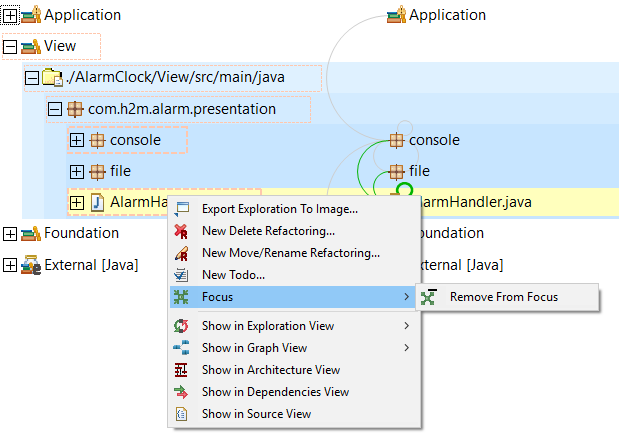 This view has been created by selecting the "console" namespace and "AlarmHandler.java" with focus mode "In and Out", that is, showing incoming and outgoing dependencies. 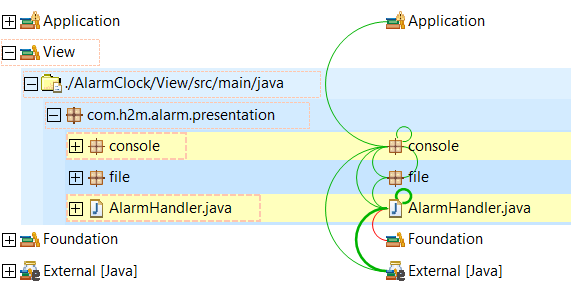 Let's suppose that for whatever reason, "AlarmHandler.java" is no longer important for the dependency analysis and we want to make of it a passive element in the dependency calculation at most. This can be achieved by right clicking on the element and selecting "Focus" → "Remove From Focus"